Last year I reviewed Street fighter 4. Arguably one of my favourite fighting games of the year. I played the game so much, my thumbs would actually hurt. Capcom in typical fashion haven’t made a sequel, but more of an update in the form of Super Street Fighter 4 with more characters, more moves and extra modes. Without me saying the same comments to last years review, I will simply say, the graphics are the same, the animations are the same, the play style and sound effects are all the same (all of which are still a big step up from the old Street Fighter 2 online game). But that said, they have changed the commentator as last year’s Street Fighter 4 had a very cheesy sounding guy! The major differences are the fact that every character now has two ultra combos. You can select which one you would like to use before you battle. This is really interesting as it can change the way you play your character altogether. For instance in Street Fighter 4, Ryu only has his ultra hadoken meaning I would constantly keep opponents at a distance, or send the opponent into the air and do an ultra hadoken, hoping to catch the opponent before he lands on the floor. Now he has the choice of an ultra shoryuken, that old play style would be useless. If you remember my last review I commented on the fact that Dee Jay and T.hawk were missing. Capcom have put both these characters back into the game and have brought back the bonus stages where you destroy a car and break barrels. They have added some of the characters from Street Fighter Third Strike, Dudley who is a boxer and has ultra moves that reference a famous Japanese anime called Hajime No Ippo. A young ninja called Ibuki and a karate girl called Makoto. Cody and Guy from Capcoms other franchise ‘Final Fight’ have also been added. The two completely new characters are Juri, a fast Taekwondo fighter and Haken, a really strange oil covered wrestler. Haken is by far the most entertaining character in the game. Every character has a new challenge mode, which is useful to learn combinations and the online has be improved. There is a mode to be able to save replays, which is great, as you can now study how people play with a certain characters or if you want to just let them remember how you beat them in the past. 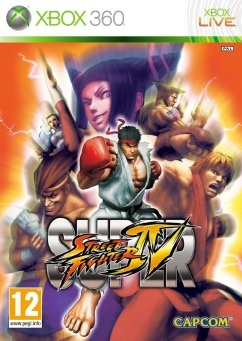 I have very little to say about Super Street Fighter 4, as it is essential the same game. That doesn’t make it bad; it’s just what Street Fighter 4 should have been. Capcom do obviously know this issue and selling the game very cheap compared to other games is probably the best idea. If you are a die-hard Street Fighter fan then this game is for you. Think of this game as Street fighter 4.5 at a cheap price.